Mohigul Isomova is one of our enthusiastic and well traveled social media experts who was born and grew up in ancient Bukhara in the family of tour industry professionals. From young ages she wanted to share her passion for her homeland and decided to learn English from young age. 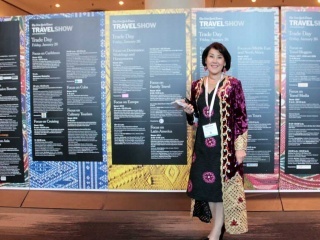 For several years Mohigul visited our US office where she learnt to create iconic itineraries, based on her local knowledge, gave the speaks about Central Asia Silk Road at the tourism shows, women travel clubs, ASTA and helped the travelers to have extraordinary travel experience in Uzbekistan and other Silk Road destinations. Fluent in English and Uzbek, Tajik and Russian Mohigul graduated from Tourism College in Bukhara with the degree in tourism, tour operator and tour agent profession. She holds travel industry top certificates and offers Silk Road Tours to Central asia as well as leisure travel to the US. Often Mohigul prepares for all our travelers welcome gifts. The SILK ROAD is Headed Your Way!